Among its neighboring buildings on the Las Vegas strip, the Vdara® hotel can be identified by its unique crescent-shaped design. While visually appealing, this architectural element became an area of concern as it contributed to the development of a caustic surface on the hotel’s pool deck. 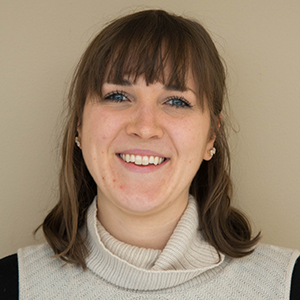 As a result, guests at particular locations experienced severe sunburns at certain days and times of the year. Here, we model the generation of a caustic surface in the case of the Vdara® hotel. Let’s begin with this scenario. Imagine you are sitting at your kitchen table, enjoying breakfast and a glass of water as the sun shines brightly through a nearby window. Sounds like an ideal start to the morning, right? Continuing with this leisurely pace, before you go to take your next sip of water, take a moment to examine the sunlight as it is refracted by the glass. While the glass produces a shadow, you might also notice that it generates a curved area of bright light. 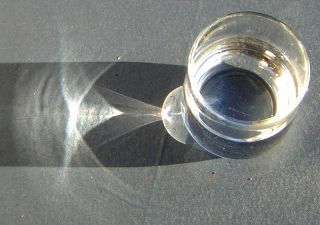 Sunlight refracted by a glass of water produces caustics. (“Kaustik an einem Wasserglas bei starker Sonneneinstrahlung” by Heiner Otterstedt. Licensed under Creative Commons Attribution Share-Alike 3.0, via Wikimedia Commons). This everyday situation provides one of the most basic examples of visible caustics. The word caustic or caustic surface refers to a continuous set of points in space at which light intensity becomes very large due to the reflection or refraction of light by a curved surface or object. The caustic surface acts as an envelope within which the reflected or refracted rays propagate. Indicated by its root from the Greek word kaustikos, meaning “burning”, some of these rays can be quite intense as they are projected onto another surface. The rays can be so strong, in fact, that they can sometimes result in sunburns. This was the case at the Vdara® hotel in Las Vegas. 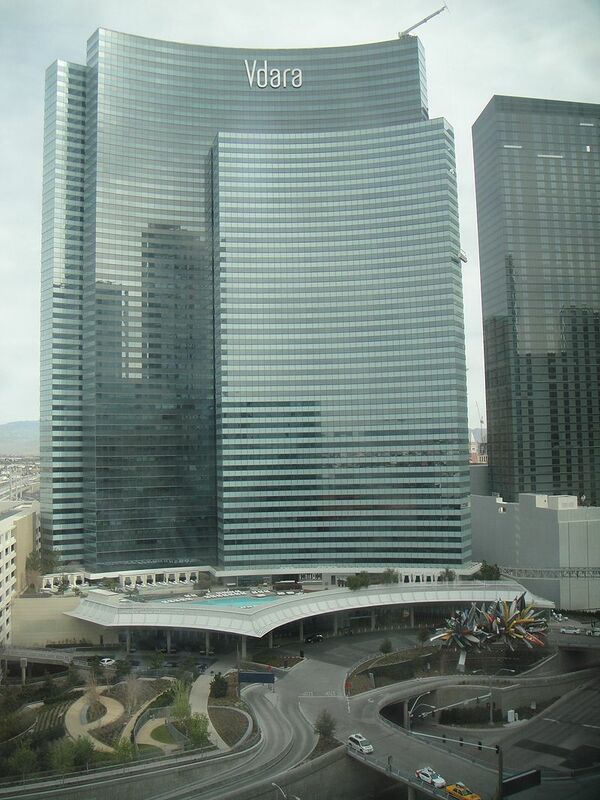 The Vdara® hotel opened its doors to the public on December 1, 2009. Located within the CityCenter™ complex, this 57-story, 1,600,000 sq ft structure features 1,495 hotel-condo suites, a two-story spa and salon, a market cafe, and a pool and lounge area. The staggered arc design of the hotel was selected to complement the arcs across the way at the Aria® Resort & Casino. The Vdara® hotel in Las Vegas. (“Photo of the Vdara Hotel in Las Vegas, Nevada” by Cygnusloop99 — Own work. Licensed under Creative Commons Attribution Share-Alike 3.0, via Wikimedia Commons). The reflective surface and concave design of the hotel was captivating to the eye. However, the design became somewhat troublesome in September 2010 as guests began to complain of extreme sunburns after lounging at the hotel’s pool. Reflecting and focusing rays from the sun, the hotel’s design generated regions of high intensity radiation on certain areas of the pool complex. This radiation became so intense at times that it resulted not only in sunburns but also in the melting of plastic cups, flip flops, and magazines. The parts of the pool deck targeted by the rays changed throughout the day, as did the rays’ intensity. Due to the way the solar angle changes throughout the year, this phenomenon was only problematic at certain times of the year. According to a 2010 article from CNN, the hotel’s designers implemented a film to protect against potential solar convergence prior to the hotel’s opening. This was noted as reducing the issue by about 70 percent. However, heightened temperatures during the summer season and at certain times of the day prompted the need for additional shading around the hotel’s pool deck, including larger sun umbrellas for protection. The impact of the caustic is evident, but what if we could visualize how the caustic surface was generated in the pool area around the times and dates these cases were reported? For this, we can turn to a Model Library example available with the Ray Optics Module. 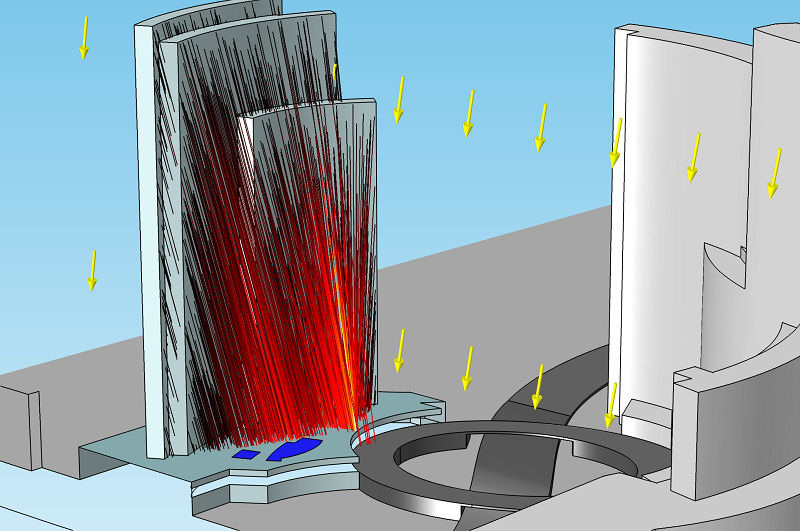 The model is based on the paper “Caustic effects due to sunlight reflections from skyscrapers: simulations and experiments” by M Vollmer and K-P Möllmann. The Caustic Surface Generated by the Vdara® Hotel model depicts a small section within the CityCenter™ complex, including the Vdara® hotel and the Aria® Resort & Casino. In this model, incoming solar radiation is reflected off the surface of the Vdara® hotel and toward the hotel’s pool deck area. Solar flux incident on the Vdara® hotel. As the rays are reflected off the concave surface, the principal radii of curvature of the reflected wavefront start to decrease in magnitude. These radii of curvature are indicators of the distance from each ray to nearby caustics, and they are changed whenever a ray is reflected or refracted by a curved boundary. As the principal radii of curvature become smaller, the ray intensity is increased. Eventually, one or both of the principal radii of curvature approach zero, creating a point on a caustic surface. The ray intensity does not actually become infinite at these points as the geometrical optics approximation predicts, but it still becomes extremely large in magnitude. These caustic surfaces correspond to areas in which the incident heat flux is very high and could potentially result in extensive burns. The model’s efficiency is increased with the use of the Illuminated Surface boundary condition, which enables the reflected rays of sunlight to be released directly from the hotel’s surface (rather than being released as ambient solar radiation). With the addition of the Accumulator feature, the intensity of each ray is projected onto the boundary mesh elements on the pool and surrounding deck. Incorporating this feature into the simulation makes it easier to visualize the intersection of caustic surfaces with the ground. The plot below shows the trajectories of the rays as they reflect off the Vdara® hotel, with the arrows indicating the direction of the incident solar radiation. 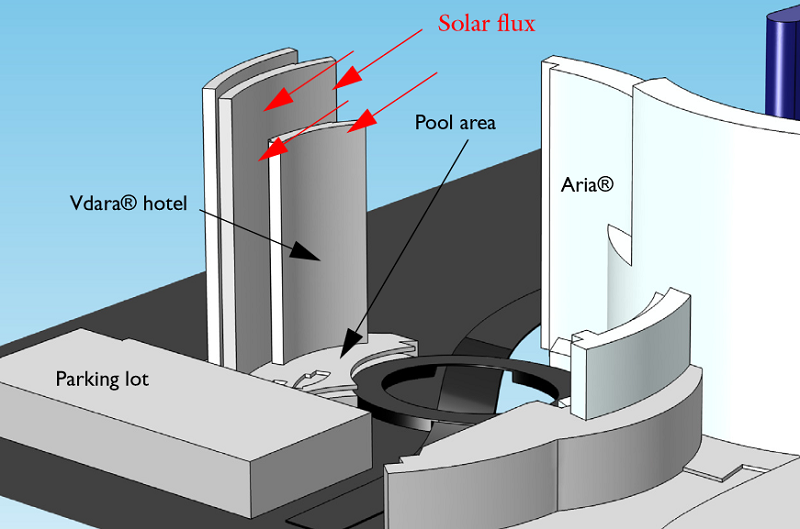 The direction of solar radiation is set up to replicate the conditions at the hotel’s pool in the month of September at the time of 11:30 a.m. After being reflected off the hotel’s curved surface, the rays start to increase in intensity as they are focused toward certain locations around the pool deck. Plot depicting ray trajectories and the direction vector of solar radiation (yellow arrows). The following animation (created by my colleague Ruud Börger) shows the intensity of the rays projected onto the pool area between 11:30 a.m. and 1 p.m. in September 2010. As you can see, the high-intensity region starts initially on the side of the pool area closest to the parking lot and then sweeps over the pool complex towards the road.